The hotter and dried the weather the better Firebush grows. Even weeds die in the best of growing conditions for Firebush. 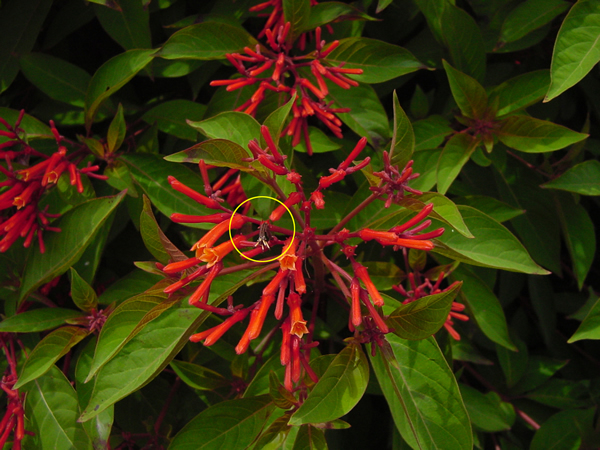 Circled is the firebush pre-aborted bloom. 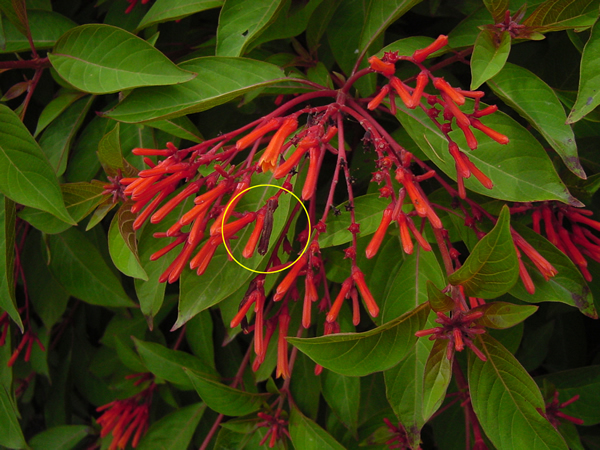 Close-up of firebush aborted bloom circled. Honeybees can't reach all the way down into a firebush bloom so they feed in the split made by another bee at the base of the bloom. 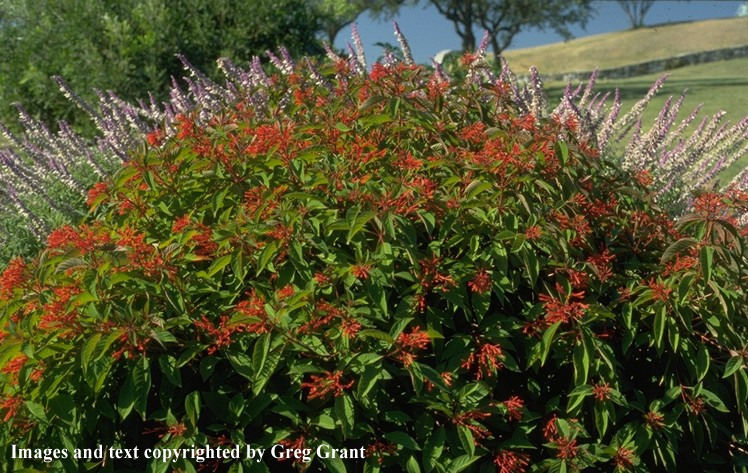 Firebush is one of the most adapted hummingbird attacting plants in Texas. Firebush...the name says it all! This tropical shrub is known for two attributes. First, the plant shows colors that would make any blaze proud. And second, it's the only plant that I know which actually performs better the closer it gets to spontaneous combustion. Hamelia patens, formerly H. erecta is a member of the Rubiaceae or Madder family. Other notable members of this family include Ixora, Gardenia, Pentas, and Coffee. The genus Hamelia was named in honor of prominent French botanical author, Henry Louis Duhamel du Monceau (1700-17820). The genus is represented by some 40 species, located in the tropics. H. patens hails from the gulf states of Mexico, South Florida, the West Indies, and Central and South America. In its native habitat, Firebush is known more for its herbal properties than for its ornamental value. The small black fruit is considered acidic and edible, and a fermented drink is supposedly prepared from it. The leaves and stems have been used for tanning. The crushed leaves are sometimes applied to cuts and bruises, and the crushed leaves with vinegar are applied to eruptions of the skin. The plant is also used for washes and for lotions to relieve swelling of the legs and to deodorize them. A syrup from the fruit has reportedly been used in the West Indies as a remedy for dysentery. 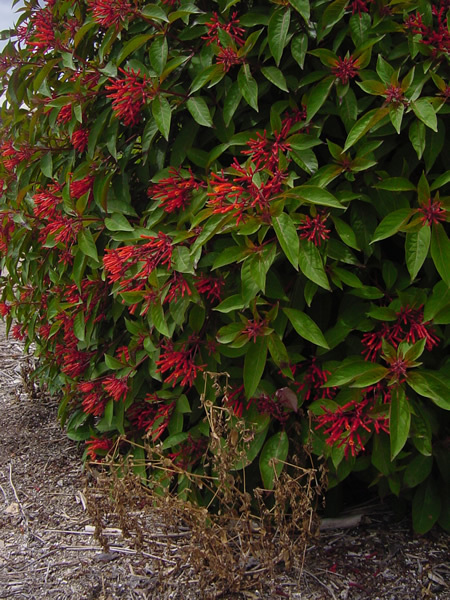 In addition to being known as "Firebush," the plant is often referred to as Scarlet-bush in horticultural references, and sometimes as Hummingbird-bush, due to the constant buzz of the dainty creatures surrounding the blooming plants. In its native locations, Firebush is known by numerous regional common names including: "kanan," "xkana," "xkanan" (Yucatan, Maya); "chacloco" (Tamaulipas); "chichipin" (Guatemala, Honduras); "recadito" (Columbia); "zorrillo real," "palo cameron" (Costa Rica); "sisipinse," "flor de cangrejo" (Guatemala); "corillo," "chichipince," "xuchit paltimatia," "flor de bao" (El Salvador); "canilla de venado" (Nicaragua); "ponasi," "bonasi," "palo de coral" (Cuba); "balsamo" (Puerto Rico); "cacanapazue," "panete" (Vera Cruz); "coral" (Honduras); and "uvero" (Panama). Still wondering why universal botanical names are necessary? 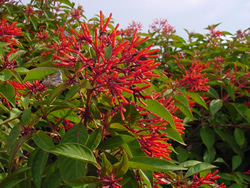 In recent years Firebush has been successfully promoted as a heat and sun loving annual bedding plant by the Texas Agricultural Extension Service. Although a shrub in its native habitat, and a perennial in the southern third of the state, Firebush really struts its stuff as a low maintenance, long season annual bedding plant. 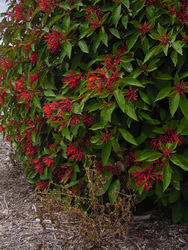 Grown as a perennial, Firebush has a few drawbacks. First of all it will freeze and die most years north of Interstate 10. In addition, it doesn't start growing and blooming from a surviving root system until the temperatures get very hot. This means that you and your hummingbirds have nothing to admire until it's too hot to do so. With the use of bottom heat and warm greenhouses, producers can provide blooming bedding plants which give instant as well as lasting color in the landscape. As an added bonus, as temperatures cool in the fall, Firebush foliage turns to a burning red. These perennial plants which are used as landscape annuals have been jokingly referred to as "perannials." Tropical perennials tend to make great southern annuals due to their heat tolerance and season long performance. Initially they may cost more, but they make it up with their endurance. Lantana and Copper Plant are two other good examples. These "perannials" are often removed with the first frost and replaced with cool season annuals such as pansies, snapdragons, and ornamental cabbage or kale. 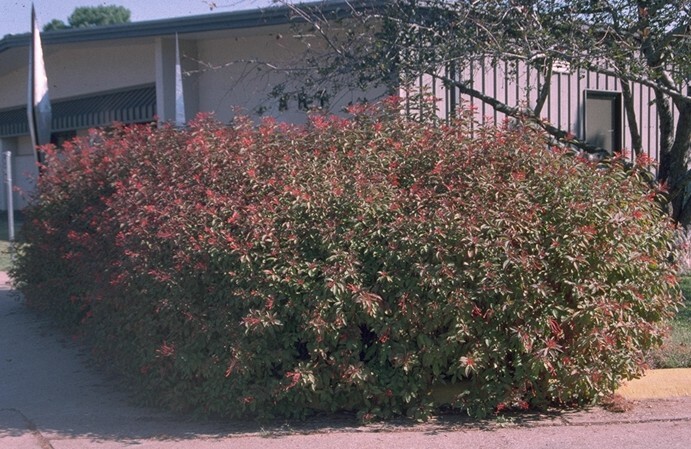 Dr. Jerry Parsons, notorious Texas Agricultural Extension Service horticulturist in San Antonio, is credited with the introduction of Firebush as a Texas bedding plant. When several established plants were called to his attention in Laredo, he couldn't help but notice that Firebush and Esperanza (Tecoma stans) were the only two showy plants which appeared to thrive in the town's searing heat. I still recall my first trip to Laredo, a number of years back, to view the original parent plants. I remember the evening news reporting that Laredo was the "hotspot" of the nation that day at 105 degrees. Sure enough, the only plants that caught my eye were Firebush, Esperanza, and one remarkable old Tea rose (Rosa odorata). 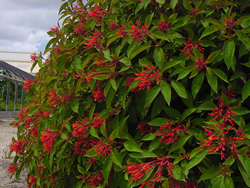 Interestingly enough, almost all of the Firebush being propagated and sold in Texas can be traced back to these Laredo plants. Therefore all of these plants are identical genetic clones. This clone is interesting in that it apparently sets no viable seed here. As the popularity of Firebush grew, reports began to surface of a yellow variation in the vicinity of Guatemala and southern Mexico. Dr. Parsons had several people look for the yellow version on trips to the area, to no avail. I hadn't thought much about it until last year. Much to my surprise, the parents of a student of mine at Louisiana State University had a citrus orchard located in Belize, Central America (formerly British Honduras). As I located Belize on the map, I couldn't help but notice that the country shared borders with Guatemala and southern Mexico. I decided I couldn't afford to miss an opportunity to view Firebush in what I hoped was its native habitat, and also to look for the reported yellow version. I also couldn't help but notice the similarity to Robert Fortune's plant collecting trip to China in 1843, for the Royal Horticulture Society, to search for the elusive yellow "Camellia," which by the way was never found. After sending pictures, articles, and descriptions ahead to Belize, I was informed upon arrival that "no one was familiar with the plant." Stricken with terror that I wouldn't see any Hamelia in Belize, much less color variations, I proceeded to comb the countryside. enough, I didn't locate a single example of the plant in cultivation. The only people I found who had any knowledge of the plant were some villagers along the Guatemalan border who used it for "fungus between the toes" (athlete's foot). Much like any wild seedling population, I did find a fair amount of variation in flower color. Although there were plants of Hamelia patens that flowered yellow-orange, orange, red, and even green, I didn't see any that were pure yellow. I did however locate an unidentified species that grew in the shade and a number of possible hybrids. After seeing Hamelia patens in its native habitat, I can understand its remarkable adaptation to Texas' growing conditions. The plant actually thrived in unirrigated, uncultivated, hot, rocky conditions (sound familiar?). Belize also has a four month dry season where they receive little if any rainfall. What makes the plant special though, is the fact that it also thrives in heavy clay soils and the high rainfall areas of East Texas and Louisiana. Firebush truly is an adaptable plant. It's possible that we may one day plant and enjoy different varieties of Firebush. But in the mean time, who's complaining? The one we have is hot! Texas Checklist: This tropical favorite of hummingbirds is adaptable as an annual for all parts of the state, and is available from most retail nurseries in various sizes. 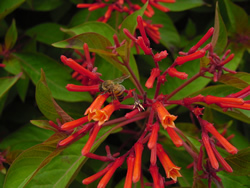 The flowers of the firebush (Hamelia patens Jacquin) are reddish-orange, small, and tubular. If pollinated, they are followed by a many-seeded berry which ripens black. The flowers are transient things opening around the middle of the night and wilting by midday. Each flower has about twelve hours in which to shed and receive pollen for reproduction. The flower is dependent upon a pollinator to aid the short cycle. The flowers produce nectar to attract bees, butterflies, and hummingbirds. In Costa Rica (and probably elsewhere), these pollinators are not the only creatures to desire the nectar. 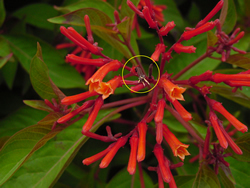 A flower mite, Proctolaelaps kirmsei, lives on and consumes the resources, nectar and pollen, of firebush flowers. During the dark hours after midnight, the tiny mites, about a half a millimeter long, consume as much as 50 percent of the pollen. Before dawn, the flowers begin producing nectar. Mites, bees, butterflies, and hummingbirds become competitors for the sugary liquid. Mid-morning the flowers stop producing nectar. The bees, butterflies, and hummingbirds can fly to other flowers, but the mites are stuck with quickly dwindling resources. The mites either have to find another flower close by or look for transportation. One of the fastest modes is the rufous-tailed hummingbird (Amazilia tzacatl) and the mites have only a few seconds. One or two will race up the bill of a feeding hummingbird and into the nares (nostrils). The mites ride until the hummingbird visits another firebush flower and, again, they have only seconds to disembark. The mites leave the nares and race down the bill to the flower. Firebush flowers do not produce a scent that humans can detect. Hummingbirds are thought to have an even poorer sense of smell, but the mites know when their transportation has reached the right flower. Inside the nares, the mites are inundated with air moving into and out of the hummer's lungs and they may detect an aroma that neither humans nor hummingbirds can.